07:10 huginn magnuse: The current temperature in Bodo, Norway is 3.0°C (7:50 AM CET on February 16, 2017). Conditions: Light Rain Showers. Humidity: 93%. Dew Point: 2.0°C. Windchill: -1.0°C. Pressure: 29.80 in 1009 hPa (Falling). 07:11 huginn LibraryClaire: The current temperature in MainaustraÃ&#376;e, Konstanz, Germany is 0.3°C (7:43 AM CET on February 16, 2017). Conditions: Mostly Cloudy. Humidity: 94%. Dew Point: -1.0°C. Windchill: 0.0°C. Pressure: 30.57 in 1035 hPa (Rising). 08:05 huginn drojf: The current temperature in Berlin, Berlin, Germany is -3.6°C (8:43 AM CET on February 16, 2017). Conditions: Clear. Humidity: 95%. Dew Point: -4.0°C. Windchill: -4.0°C. Pressure: 30.42 in 1030 hPa (Steady). 08:11 huginn eythian: Error: No such location could be found. 08:12 eythian you go somewhere else for one day, and huginn forgets all about you. 08:27 huginn LibraryClaire: The current temperature in MainaustraÃ&#376;e, Konstanz, Germany is 1.1°C (9:16 AM CET on February 16, 2017). Conditions: Light Freezing Fog. Humidity: 95%. Dew Point: 0.0°C. Windchill: 1.0°C. Pressure: 30.54 in 1034 hPa (Steady). 08:30 huginn eythian: The current temperature in Amsterdam, Netherlands is 6.0°C (9:25 AM CET on February 16, 2017). Conditions: Partly Cloudy. Humidity: 100%. Dew Point: 6.0°C. Windchill: 3.0°C. Pressure: 30.39 in 1029 hPa (Steady). 09:03 d_antonakis can I ask sth regarding Pootle? 09:03 d_antonakis Is there a way to change the user permissions in order to prevent other users to overwritte their translations strings? 09:04 d_antonakis Moreover, who knows the procedure to add terminilogy in a specific language? 09:05 cait d_antonakis: you can have different permissions - one of them is to allow uploads - is that what you mean? 09:07 d_antonakis ok cait! ty! 09:20 Joubu Is someone playing on a devbox around? 09:34 Joubu josef_moravec: could you try master + searchengine=elastic + full reindex + search? 09:41 huginn AndrewIsh: The current temperature in Machynlleth, Machynlleth, United Kingdom is 8.8°C (9:40 AM GMT on February 16, 2017). Conditions: . Humidity: 92%. Dew Point: 8.0°C. Windchill: 9.0°C. Pressure: 30.34 in 1027.3 hPa (Falling). 09:42 AndrewIsh I've just been checking the developer docs. What's the situation with creating a UI with functionality that's dependent on JS. Is it necessary to also provide a mechanism that isn't dependent on JS? 10:08 stuart I am hoping to find a suggestion on a problem I have, if anyone is around. 10:09 stuart well, I have set up a koha server for a local primary school, and it is working very well. 10:09 stuart however, I need to setup z39.50 access to SCIS, an australian data source for which they have a login. 10:13 josef_moravec also, are they providing data in MARC21, or UNIMARC? 10:15 stuart unfortunately they do not specify their MARC version. 10:15 stuart what is the easiest way to send a screenshot? 10:16 stuart I can make one easily, I meant how to send it to you. 10:19 stuart working on it now..
10:21 stuart I believe the item is found, as the result for a random ISBN is just the normal not found box. 10:22 stuart ah, and your suggestion has solved it for me josef! 10:22 stuart I was randomly trying different setups, and MARC21/USMARC works. 10:44 huginn drojf: The current temperature in Berlin, Berlin, Germany is 2.7°C (11:18 AM CET on February 16, 2017). Conditions: Clear. Humidity: 93%. Dew Point: 2.0°C. Windchill: 1.0°C. Pressure: 30.39 in 1029 hPa (Steady). 10:46 huginn LibraryClaire: The current temperature in MainaustraÃ&#376;e, Konstanz, Germany is 4.0°C (11:18 AM CET on February 16, 2017). Conditions: Clear. Humidity: 90%. Dew Point: 2.0°C. Windchill: 4.0°C. Pressure: 30.51 in 1033 hPa (Falling). 10:46 huginn drojf: The current temperature in Berlin Schoenefeld, Germany is 8.0°C (11:20 AM CET on February 16, 2017). Conditions: Clear. Humidity: 62%. Dew Point: 1.0°C. Windchill: 6.0°C. Pressure: 30.39 in 1029 hPa (Steady). 10:58 eythian luging in the wet? 11:22 josef_moravec But i have problem searching authorities, did you noticed it? 11:33 josef_moravec And is authority searching working for you? Maybe I have bad mapping, bud I did try the magic URL you sent and it's still not working..
11:37 kidclamp does it work if you set the sorting to none josef_moravec? 11:41 josef_moravec kidclamp: it does not return ISE, but still not searching - "no results found"
11:42 josef_moravec an sometimes still ISE: Invalid marclist field provided: all at /home/vagrant/kohaclone/Koha/SearchE​ngine/Elasticsearch/QueryBuilder.pm line 422. 11:43 Joubu "Fielddata is disabled on text fields by default"
11:44 wahanui i guess system preference is not the way to do it. 11:44 Joubu kidclamp: yes, it is set to "both"
11:50 eythian wahanui: kidclamp is an infobot. 11:50 kidclamp Joubu, indeed - see "work to be done"
11:50 eythian wahanui: kidclamp is also an infobot. 11:51 * Joubu should read commit messages until the end..
12:03 tcohen do u remember which release got your Upload.pm replaced? 12:06 marcelr tcohen: can you qa the followup for the debian scripts? 12:37 marcelr josef_moravec: is your index up again? 12:38 marcelr for a retry of the DelAuthority bug? 13:03 Joubu marcelr: just let a comment about something else, could you take a look? 13:06 marcelr that may happen..
13:09 marcelr Joubu: is dev_install the name of your instance? 13:10 marcelr i thought so; whats the problem then? 13:12 barton look is you are in a maze of twisty passages, all alike. 13:47 Joubu baptiste: the commit messages of the patches must start with "Bug XXXXX: "
13:53 Joubu marcelr: do you remember why you search for ^- ? 13:53 eythian Joubu: that searches for "not -"
13:55 Joubu 275 die "Error: dev parameter without instance"
13:55 huginn eythian: The current temperature in Amsterdam, Netherlands is 9.0°C (2:25 PM CET on February 16, 2017). Conditions: Partly Cloudy. Humidity: 82%. Dew Point: 6.0°C. Pressure: 30.36 in 1028 hPa (Steady). 14:04 marcelr the hardcoded path to /usr/share/koha/bin is one of them..
17:16 gabpalko Does anyone know how can I reach authority records through any protocol? 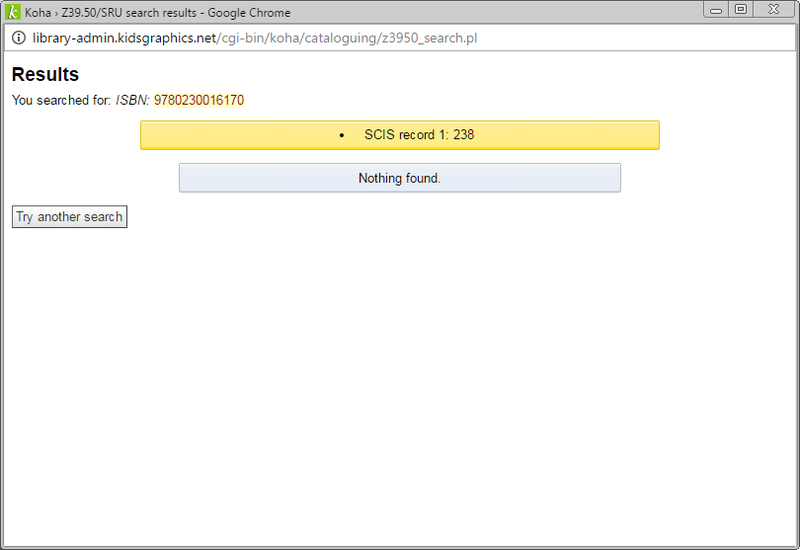 OAI PMH, REST does not seem to work, they only list bib records. 20:27 wizzycray long shot, joubu about? 22:33 CrispyBran Any programmers here I can bug for a moment? 22:35 CrispyBran When a koha page loads, it uses variables to populate information on the screen. Is it possible to reference those variables from jquery? 22:38 dcook CrispyBran: Could you clarify what you man by "it uses variabls to populate information on the screen"? 22:39 dcook @later tell tcohen Interesting. Honestly, I'm overloaded with work at the moment, so I don't have much in terms of commentary. 22:39 huginn dcook: The operation succeeded. 22:41 CrispyBran For example, member-password.pl places the firstname and surname on the screen in a couple places. I would like to grab the surname, but because this information is blended together, there is no reliable way to get the last name from those elements. So, I was wondering if there would be some other method to "get" the surname. Such as, are the template params used on that page accessable, or is gone by the time the page is produced? 22:44 CrispyBran And how do I know what is in the DOM? 22:47 wizzycray you can't access the template variables directly as far as I am aware. 22:49 CrispyBran bummer. That's what I was afraid of. 22:58 dcook If it's like "<p>Firstname Surname</p>", you could change it to "<p><span id="member_firstname">Firstname</span> <span id="member_surname">Surname</span></p>"
22:59 dcook Then use jquery with a selector like "span#member_surname"
22:59 CrispyBran yeah, monkeying with the files is not my thing just yet. 23:00 CrispyBran I was trying to use jquery to create a reset button for the password. But I can't get specific enough with patron information. 23:02 dcook A reset button for the password? 23:04 CrispyBran Yes. We base passwords off pieces of patron data. Patrons can change their passwords, but sometimes they forget, and we have to reset their password. I was trying to see if I could grab patron data and populate the password fields. But that isn't going to happen. 23:09 dcook I've been thinking a little about that. How some libraries will use parts of your address or phone number. 23:10 wizzycray I know libraries do it, I'm here to tell you that they shouldn't. 23:10 CrispyBran Does koha have a "Forgot your password?" feature yet? 23:11 wizzycray since 16.05 at least. 23:14 CrispyBran Yep...OpacResetPassword. Not in 3.22. 23:48 CrispyBran When creating a new account in Koha, does Koha generate a default username and password, or do staff have to enter that info?